This is 4 of 7 part of struts 2 tutorial. 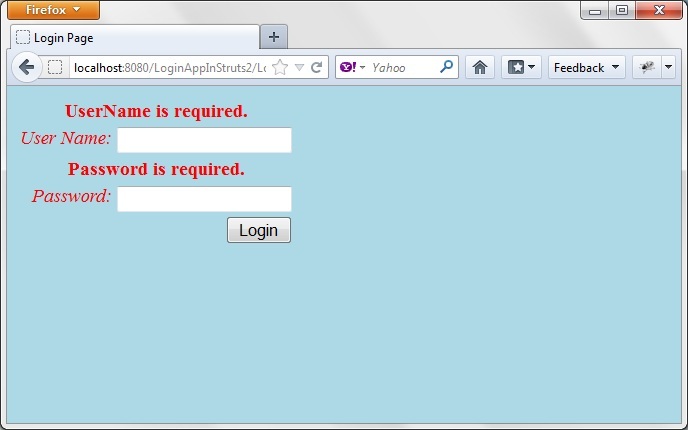 In this example we will see how we can validate a login page using Struts 2. In previous post, we have learned about mapping from client request to action class and rendering appropriate jsp on the basis of returned string of execute() method of action class. In this post,we will use struts ui tags to create login page so we will learn how to use tags. 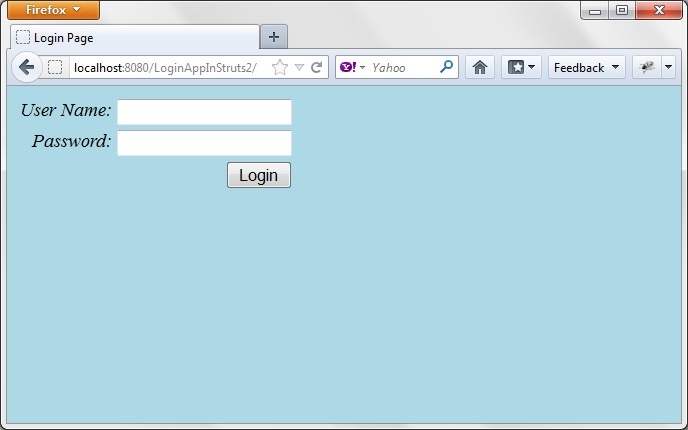 Create project named “LoginAppInStruts2”.For configuring struts 2 in your eclipse IDE please refer configuring struts 2 link. 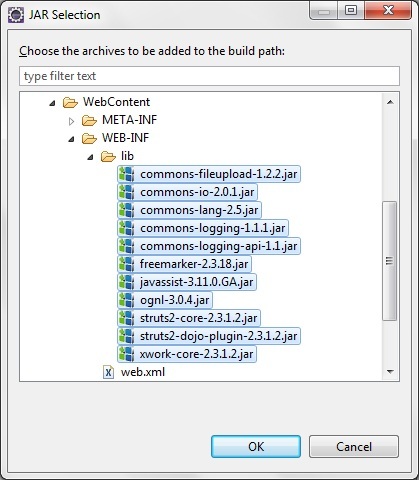 Create web.xml file in under the folder WebContent/WEB-INF. 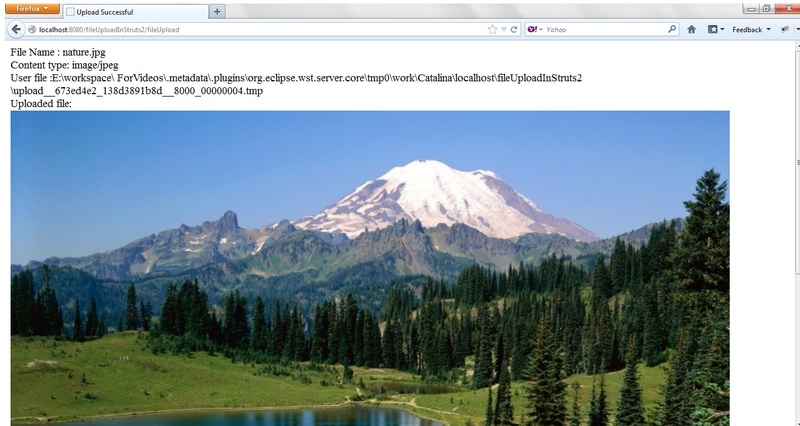 Create login page as login.jsp under WebContent. &<%@ page language="java" contentType="text/html; charset=ISO-8859-1"
is a directive used in jsp for including struts tag files. The s:form tag contains all the form elements. The action attribute contains the action name to wich the form should be submitted. This action name should be same as the one specified in the XML declarative architecture. 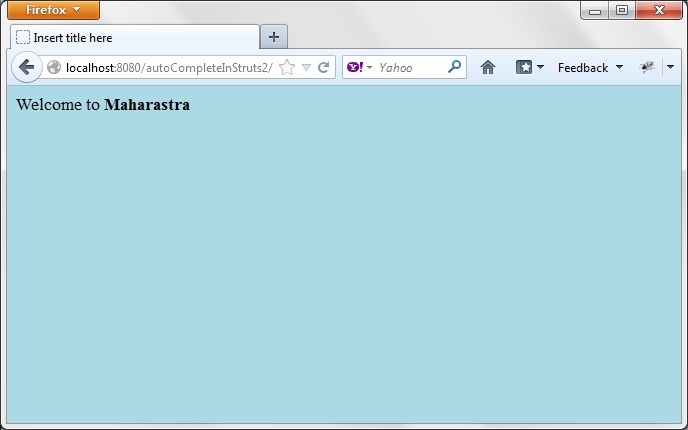 In this example we use struts.xml file to do the configuration. The textfield tag is used create a text box. The label attribute of the textfield tag contains the name to be displayed on the page and the name attribute contains the name of the property in the action class to be mapped. The password tag is same as the textfield tag except that the input value is masked. The submit tag is used to create a submit button, the value “Login” represents the label of the button. Note that the code is simple without any HTML tables, this is because Struts 2 will automatically create the necessary tables for the page based on the theme selected. By default the XHTML theme is selected. When user click on login button,Request is forwarded to Login action. Our LoginAction class extends ActionSupport. It is good to extend ActionSupport class as it provides default implementation for most common tasks. The ActionSupport class implements Action interface which exposes the execute() method. The following constants are declared in the Action interface which can be used as return values in the execute() method. public static final String SUCCESS = “success” ERROR is returned when the action execution fails. INPUT is returned when the action requires more input from the user. LOGIN is returned when the user is not logged into the system. NONE is returned when the action execution is successfull and there are no views to display. private String userName;– It should be same as name of textfield for getting userName as input defined in login.jsp. 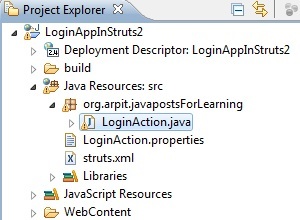 tag -you can notice that we have used Struts tag .It renders value of attribute of action class.In this case,attribute is userName of loginAction.java.So whatever user entered in userName textfield will appear at that place in Welcome.jsp. Create struts.xml in src.struts.xml provides mapping between url to action mapping. Here our “default” package extends “struts-default” package. By extending the “struts-default” package the action will by default inherit the set of interceptors defined in the defaultstack. 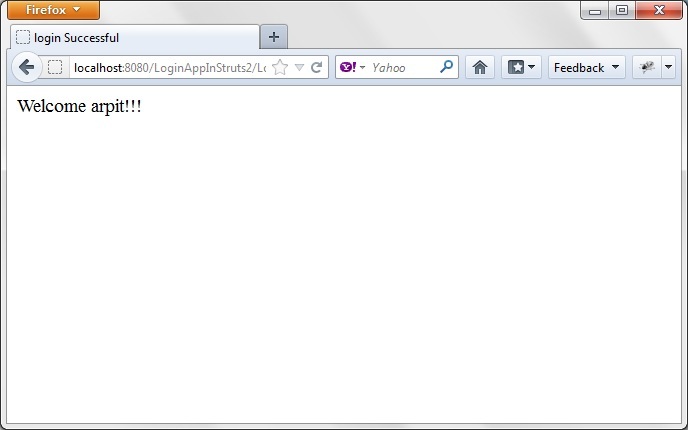 The “struts-default” package is defined in the struts-default.xml file. All the common tasks done by the Actions are seperated and placed in different interceptors. You can define an interceptor stack for each action. Most commonly used interceptors are grouped in defaultstack of the struts-default package. The defaultstack will be sufficient in most cases. The inteceptors will be fired in the order in which they are declared in the stack both before and after the action is executed. Now lets see the roles played by the different interceptors. 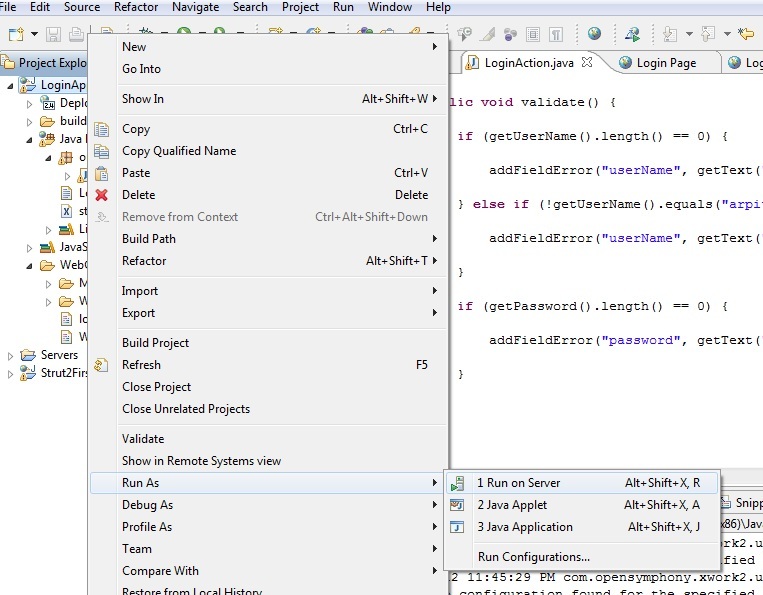 The params interceptor helps in transfering the request data onto the action object. The workflow interceptor controls the flow of cotrol. The workflow interceptor checks whether the action implements the Validateable interface , if it does, the workflow interceptor will invoke the validate() method of the Action class. In the validate() method we validate the user name and the password. If the validation fails an error is added using the addFieldError() method. The validate() method doesn’t return any errors, instead it stores all the errors with the help of the ValidationAware interface. 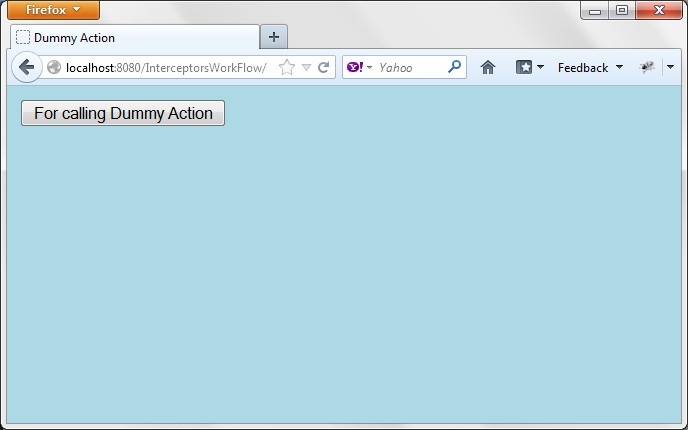 Now the workflow interceptor will check any validation errors has occured. If any error has occured the workflow interceptor will stop the request processing and transfer the control to the input page with the appropriate error messages. ResourceBundle is very useful Java entity that helps in putting the static content away from the source file. 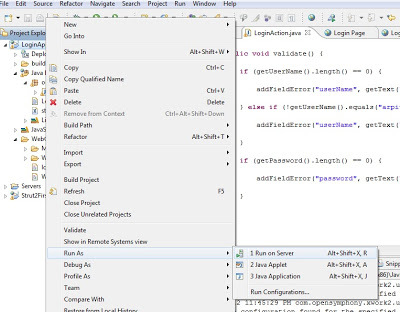 Most of the application define a resource bundle file such as ApplicationResources.properties file which contains static messages such as Username or Password and include this with the application. The properties files should have the same name as the Action class. In our case the properties file name is “LoginAction.properties” and the Action name is “LoginAction.java“. This property file should be present in WEB-INF/classes folders when the source is compiled. Create LoginAction.properties under src.Copy following content to LoginAction.properties. so when you paste resultant url(https://localhost:8080/LoginAppInStruts2/) to your browser,you will get some thing like this. If you directly press login button without entering anything.You will get following. if you enter userName as “mandliya” .you will get following. Now in next post,we will understand concept of interceptors in detail.